This is all about a nice short Sunday drive along one of my favorite stretches of the Blue Ridge Parkway. It begins in Asheville, NC where I spent Saturday, and drives up and along the crest of the some of the highest peaks in the east, the Black Mountains. Being Super Bowl Sunday, I normally would have to bypass the short parkway road trip and make it back quickly as not to miss the big game. However I had no real interest in either team this year and the weather conditions were setting up for a memorable drive along the parkway. This weekend brought an unusual but not rare weather condition set up in western NC. It is known locally as “The Wedge”. It is marked by low clouds, fog, drizzle, and cool air at the lower elevations. Northeasterly winds come off the Atlantic and push all of this mess over us and against the mountains, where it usually can move no further. When this occurs, temps like they were on Sunday were near 40 at the 700 ft level. To escape this, you have to drive up, the further up you go the better it seems. At the 4000 ft level, the sun is breaking out, temps are as high as the low 60’s, and views are tremendous, as all you can see way below is the tops of the clouds that are hovering the over the valleys & lower elevations and the mountains that rise above from them. On a day when most people wouldn’t think to drive up to the mountains to see the parkway, is when some of the most beautiful sights can be found. The sights are hit or miss though. There were several areas where the fog was very thick. Most of this was in the Craggy Gardens and Mount Mitchell areas where the elevations were at the 6000 feet and above mark. We were very excited to drive up to 6684 feet on the top of Mount Mitchell only to find the fog so thick we could hardly even see each other. 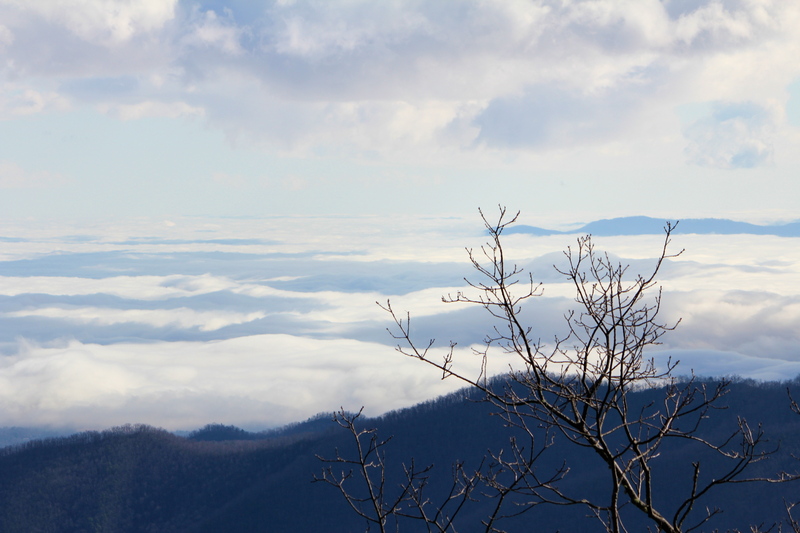 Craggy Gardens is a great place to go for beautiful scenery, but today it was all fog and surprisingly strong winds. Luckily, once past Mount Mitchell and back at the 5000 ft mark, blue skies began mixing again with the fog and some panoramic scenes of the Linville Gorge opened up to the north. This is marked by Table Rock, a trapezoid shaped rock topping the highest peak in the Linville Gorge, and Hawksbill Mountain sits just to its left in the photos. These peaks along with a blanket of low clouds below us made the views breathtaking. Views like this are what keep junkies like me coming back. I didn’t have time to get any hiking done or get a chance to see any real waterfalls, but sometimes a short drive on the parkway can be just enough to enhance your day and tide you over until your next hike. I still made it home in time to see the Giants topple the mighty Tom Brady and his Patriots for the second time in four years.